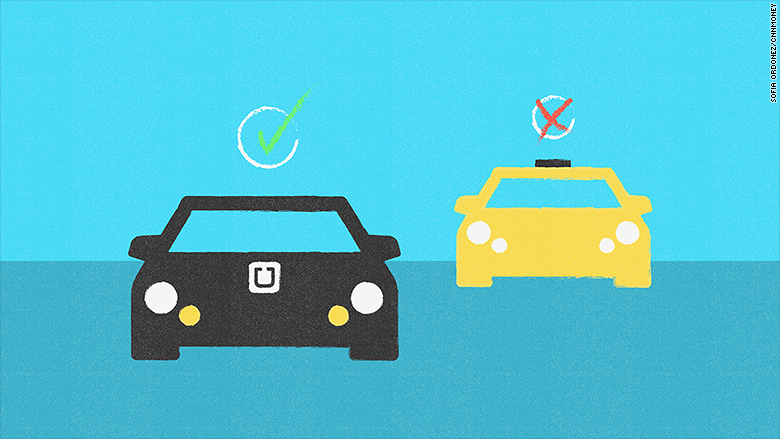 Uber is replacing cabs for professionals on the go. It's just one way that business travelers are embracing the new sharing economy -- and ditching traditional modes of travel as a result. "There's also a decrease in rental car usage, and it's at the benefit of Uber," said Bob Neveu, CEO of Certify, a travel and expense firm. Certify looked at 8 million transactions across North America from April through June. Uber accounted for 55% of all rides, up from 18% just one year ago. Cabs came in second (43%) and Lyft rides made up just 1%. The largest shares of Uber customers are in San Francisco, Dallas and Los Angeles. According to Neveu, the fact that business travelers are adopting new services is partly a result of companies changing their policies. In the past, many had prohibited private services like Uber and Airbnb -- but that's starting to change. "They're seeing [sharing economy services] as a viable option -- and potentially a cost-saver," he said. "A lot of times, companies are more interested in the dollar amount." The report found that taxi rides were more expensive than both Uber and Lyft -- an average $34.48 compared to $30.03 and $22.51, respectively. Airbnb rentals still account for a small number of bookings, but they're growing -- up 143% from last quarter. Business travelers are also happier when they stay at an Airbnb property. Certify asks customers to rate their stays: Airbnb earns an average of 4.72 stars out of 5, compared to 4.04 for hotels. While startups are changing how people travel and sleep, they're still relying on chain restaurants for their meals. Starbucks (SBUX), McDonald's, Subway, Panera Bread and Dunkin' Donuts make up the top five most expensed restaurants. Correction: A previous version of this story misstated the amount of transactions.